As Yemen's War Worsens, Questions Grow About The U.S. Role : Parallels The U.S. has been supporting Saudi Arabia's bombing campaign in Yemen for more than a year. An airstrike that killed at least 140 people at a funeral has renewed a debate about U.S. involvement. 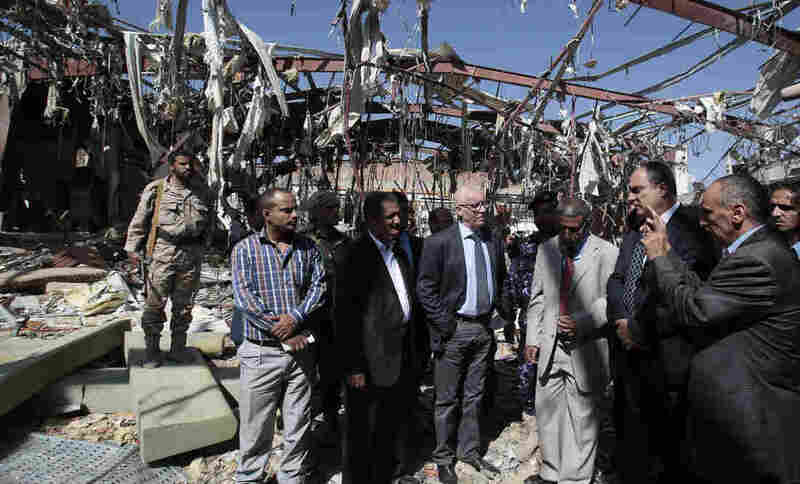 The United Nations humanitarian coordinator for Yemen, Jamie McGoldrick (center, in light blue shirt) inspects a funeral hall on Monday, two days after it was destroyed in Sanaa, Yemen, in an airstrike by a Saudi-led coalition. At least 140 people were killed. Throughout his tenure, President Obama has made it clear he has no appetite for involving the United States in another Middle East conflict. Yet the U.S. is bombing daily in Syria and Iraq. And in a separate conflict that's receiving far less attention, the U.S. is increasingly embroiled in Yemen. Since March 2015, the U.S. has been providing support to a Saudi-led military coalition fighting Houthi rebels. The Houthis ousted Yemen's government and forced the president, Abed Mansour Hadi, to flee to Saudi Arabia. Initially the Saudis thought they could easily uproot the Houthis, but the conflict has ground on much longer than the Saudis expected. As a result, Chris Murphy, a Democratic senator from Connecticut, says the U.S. is becoming an indispensable partner to Saudi Arabia and its bombing campaign there. "The United States provides the bombs. We provide the refueling planes in mid-air. We provide the intel," Murphy tells NPR. "I think it's safe to say that this bombing campaign in Yemen could not happen without the United States." Yet Murphy says U.S. involvement in the Yemen conflict is getting very little notice. "It's wild to me that we're not talking more about this," he says. "The U.S. is at war in Yemen today, there's no doubt about it." The U.S. got involved for at least a couple reasons, according to analysts. The al-Qaida affiliate in Yemen is considered extremely dangerous, and includes a bombmaker accused of plotting attempting to blow up U.S. airliners. The U.S. is concerned that chaos in Yemen will strengthen al-Qaida there. Also, the U.S. wants to show it takes Saudi security concerns seriously, and the kingdom is deeply troubled by the turmoil in neighboring Yemen. U.S.-Saudi ties have been strained over issues such as the nuclear deal with Iran, Saudi Arabia's main rival in the region. The U.S. role is not risk-free. A U.S. Navy destroyer, the USS Mason, came under a cruise missile attack Wednesday as it sailed near the coast of Yemen. This was the second time this has happened this week, according to U.S. officials, who said no one on the ship was injured. As the war continues in Yemen, with no end in sight, there are questions about the wisdom of the U.S. backing for the Saudi military campaign. Murphy is one of several members of Congress calling for the administration to end its support for the Saudi-led effort in Yemen. This comes after airstrike on a funeral in the capital city, Saana, over the weekend killed at least 140 people and injured more than 525 others. The attack prompted widespread condemantion from human rights groups, and the United Nations. The White House quickly released a statement denouncing the attack and warned the long-standing security arrangement with the Saudis is not a blank check. State Department spokesman John Kirby says the U.S. is reconsidering its support. "In light of the attack over the weekend, with the scrutiny that attack legitimately calls for, we are going to undertake additional reviews of aid and assistance that goes to Saudi Arabia," he said. This is not the first time airstrikes have landed on civilian targets — hospitals and wedding halls have also been hit in the past. Kirby says the U.S. was not certain whether the bombing at the funeral was deliberate or an accident. And the U.S. is concerned about the increasing number of civilian casualties caused by U.S.-made weapons. "We have been nothing but candid and forthright with the Saudis about our concerns over civilian casualties and collateral damage, and our concerns about lack of precision in the conduct of some of these strikes," he says. The Houthis are also been blamed for widespread casualties in the Yemen conflict. The group, which has support from Iran, has fired missiles into populated areas, and staged cross-border attacks into Saudi Arabia. But airstrikes by the Saudi-led coalition are believed to have killed many more people. The war has so far killed an estimated 10,000 people, nearly half of them civilians, according to the United Nations. U.N. Secretary General Ban Ki Moon, speaking after the attack on the funeral on Saturday, singled out the Saudis for their role in the conflict. "Aerial attacks by the Saudi-led coalition have already caused immense carnage and destroyed much of the country's medical facilities and other vital civilian infrastructure," he said. Saudi Arabia initially denied any involvement in Saturday's attack, which it called regrettable and painful. The kingdom later said it would launch an investigation, but did not admit responsibility.